Harry was an Observer flying the Douglas A-20 in the early years of World War 2. 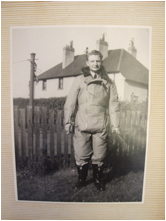 Harry Ernest Demmar TILBY was an Observer flying the Douglas A-20 (in R.A.F. parlance – the 'Havoc' or 'Boston') in the early years of World War 2. Harry was born on the 19th of April, 1921 in Hackney, East London to Sydney and Doris Tilby. He was the second born of their three children with a sister, Alice, born two years before him and a brother, George, born in 1926 but who died just two years later from diphtheria. He attended Brockley County Grammar School in South East London, after the family moved to Lewisham. At school he was a keen sportsman and musician and left with good grades in several subjects including chemistry. That enabled him to begin work in 1939 at the Royal Arsenal Ordnance Establishment in Woolwich, South East London. This Government facility was responsible for the development and manufacture of several types of ordnance for the British military. On the outbreak of war, Harry's role within the organisation was declared a 'Reserved Occupation'. This meant that he would not be liable for conscription into the armed forces, as his work was considered vital to the war effort. Despite this, perhaps through a sense of duty given his father's service in the first World War when he lost an arm, Harry enlisted in the Royal Air Force in February, 1940 aged 18 years 10 months. Between then and January, 1941 he completed a thorough training regime encompassing initial service life, aircrew training and specialisation in navigation, bomb aiming and gunnery. He had progressed through the ranks to Sergeant and was also awarded his Observer's winged brevet (among Observers this was irreverently referred to as 'the Flying A***hole' !!) denoting aircrew status. Training completed, he was posted to 23 Squadron based at Ford Aerodrome on the West Sussex coast of Southern England. At the time, they were flying Bristol Blenheim Mk. 1's on 'Intruder' missions over occupied France, Belgium and Holland. After a couple of months settling in and flying several training sorties, on the 7th of April, 1941 Harry flew as Navigator on his first 'Intruder' mission. In Blenheim YP-T they patrolled the Luftwaffe airfield at Lille, Northern France. They arrived back at Manston, Kent in the early hours of the next day but there are no combat reports posted. On the 12th of April, he was permanently crewed with Pilot Officer A. J. (Jack) Love as Pilot and their Air Gunner/Wireless Operator was Sergeant Malcolm Bunting. Harry is on the right, Jack Love centre and Malcolm Bunting on the left. 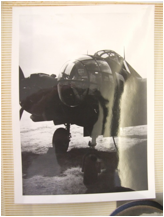 Four days later they got their hands on a brand new A-20 Havoc 1, shown in his Flying Log Book as '908', for practice intruder sorties over Southern England. 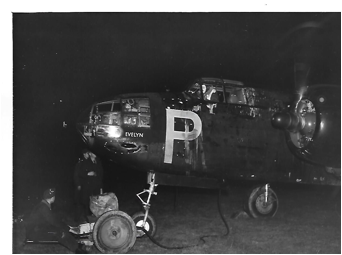 Over the next two days they undertook two more operational missions to Gravelines, Merville and Lille in Blenheim YP-T.
Havocs now became 23 Squadron's standard aircraft and Harry's crew began their affection for BJ471 YP-P or, as she was named, 'Evelyn'. They spent the rest of April and into May flying 'Evelyn' on several training sorties until the 3rd and the 6th when they took her intruding over Villacoublay and Lille. One other mission was flown in May, this time to Vitry in Havoc YP-K. There were four missions in June, two in 'Evelyn' both to Le Bourget, but one had to be abandoned due to r/t failure. They took off in YP-Z on the 16th heading for Le Bourget again, but were recalled to base. However, they completed another 'trip' the next day again in Z, this time to Vitry. It was a very sad month for Harry and the squadron that June. 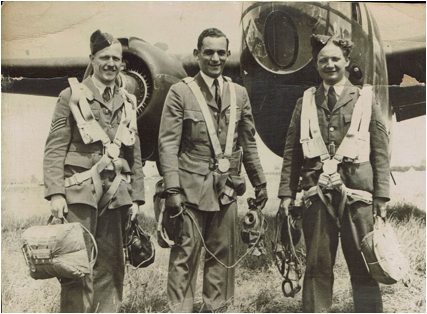 He lost his best mate Lloyd in a flying accident and, in a letter home to his parents, he tells how a New Zealand gunner fell out of an aircraft while flying through low, bumpy clouds. At a low altitude, his parachute failed to open and he was killed. But life, and war, carried on and more productive intruder missions were carried out at the beginning of July. Railway yards at Abbeville were bombed and the Luftwaffe airfields at Le Touquet and Caen received similar 'presents' from the crew. 'Evelyn' carried them on these trips and returned them safely to Ford. August arrived and the squadron diverted their attention to Holland, with Harry's crew paying two visits to airfields at Gilze-Rigen and Eindhoven. It was back to France at the end of the month where Beauvais and Poix were their destinations. 'On arrival over the target area the Visual Lorenz system was switched on and two aircraft in the air switched on their navigation lights but, as the Havoc was at 7,000 feet, an interception was impossible. The aerodrome lights were then switched off. The Havoc was at the North end of the runway and an aircraft with its landing lights on was seen about to take off from South to North. The Havoc did a steep turn and dive to bring it on the runway and dropped 18 x 40lb G.P. bombs and 60 x 4lb incendiaries from 4,000 feet immediately in front of the enemy aircraft. The enemy aircraft's landing lights slewed perpendicularly into the sky and a few seconds later the aircraft burst into flames and the fire could still be seen when the Dutch coast was recrossed at HAAMSTEDE on the way home. There were two more trips in September, both in 'Evelyn', to bases in France. October, 1941 was a very quiet month for the squadron, with Harry's crew carrying out no operational flights only local practices and night flying training. In November, they carried out one intruder mission in YP-H on the 6th and their final flights with 23 Squadron were in their favourite aircraft 'Evelyn' on the 18th and 19th. During their time with 23 Squadron Harry, Jack and Malcolm flew 'Evelyn' on 72 occasions, twelve of them on 'Intruder' sorties over enemy territory. The Air Ministry was becoming concerned over the mounting losses of aircraft from German intruders over R.A.F. airfields and decided to form another 'intruder' squadron from new Canadian aircrew arriving in the U.K.
23 Squadron were the recognised leaders in this type of air warfare, so a nucleus of four crews from there were posted to Debden in Essex to help form 418 Squadron, Royal Canadian Air Force. Harry and his crew were among those chosen and a member of one of the others was a Mexican citizen and Air Gunner, Flying Officer S. S. de Mier. However, a shortage of spare parts together with particularly bad winter weather meant very little flying was carried out during December, 1941 and January, 1942. On a brighter note, Harry was awarded his 'crown' to go over the Sergeant's stripes on promotion to Flight Sergeant on the 1st of December. Early 1942 and, because of the weather, no flying was carried out until the 11th of February and for the rest of the month that was confined to training flights to build up the experience of the new Canadian aircrews. On the 9th of March several aircrew, including Harry's, were despatched to Tangmere, Sussex to carry out exercises with 23 Squadron in order to speed up the training regime. Before returning to Debden some days later, they were fortunate enough to take 'Evelyn' out for a test flight. Much to their pleasure no doubt! All this time, Harry had been unable to obtain the necessary fabric 'crowns' in Debden to sew above the stripes on his uniform. So in a letter home, he asked Mum and Dad if they could get some for him in London as well as a pair of new shoes! His letter ends; 'I will send the necessary on.' Meaning he will send the money for the items to them later. Finally, on the 22nd of March, 1942 authority was received from Fighter Command which placed 418 Squadron on an 'Operational' basis. On the 27th of March eight crews were detailed for a 'Nursery Trip' (its first operational sortie) but, instead of 'Intruding', they bombed the oil refineries at Ertvelde near Ghent, Belgium. The very next night, four crews, including Harry's, took off to intrude over airfields at Gilze-Rigen, Lille and Vendeville. Unfortunately the aircraft they were in, W8340 TH-J, developed an undercarriage warning light problem and they had to return to Debden. 'Dear Mum and Dad, I have just received the parcel and am very pleased with the shoes. I will let you have the damage (money) when I see you – if that's okay. I shall not be getting seven days (leave) as soon as I expected – at least, that is how things stand at present but I may be home on 48 (hours leave) within the next week or so ! I will let you know – by phone probably – if I get seven days otherwise I shall just bust in on you. Later on that same day, Harry's crew were tasked with intruding over familiar territory, to them, of Beauvais and Poix airfields in Northern France. 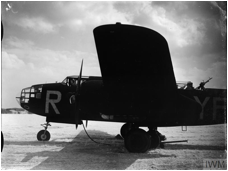 They were allocated W8351, coded TH-H and flew her to West Malling airfield in Kent to refuel for their sortie. They took off from West Malling at 0002 hours on Friday the 3rd of April. Later that day having failed to return from France, they were reported as 'Missing'. 'Regret to inform you that your son F/Sgt Harry Ernest Demmar Tilby is missing as a result of air operations on 3rd April, 1942 letter follows STOP Any further information will be immediately communicated to you. He was killed just sixteen days before his 21st birthday. 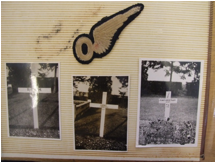 Harry's Observer's Brevet and the three original grave markers. 'Twin engine bomber crashed on the boundary of a German Airfield at La Terres A Cailloux (Old map ref 5/N23). At 02.45 hours on 3rd April, 1942 the aircraft approached Montdidier from the South with one engine on fire. There was one mid-air explosion, followed by a second on impact. No trace of debris was found (by this team). The local police report having found the numbers W8351 TH���..
Later research shows that there was some misunderstanding in translation and W8351 actually crashed at Cayeux, just North of Montdidier. 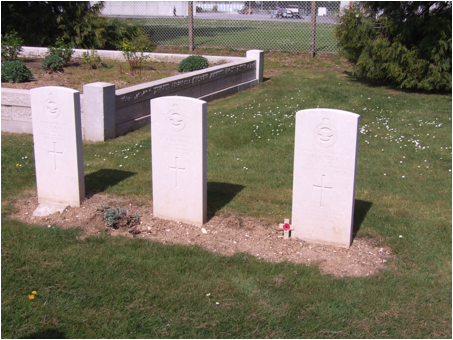 The Germans allowed the local communal authorities to bury Harry and his colleagues in the local military cemetery at Montdidier. Led by their Mayor, Mr T. Evrard, they continued to look after the graves until the Imperial (now Commonwealth) War Graves Commission took over responsibility. Their final resting place on the 3rd of April, 2017 – 75 years, to the day, that they fell. Harry's sister Alice was my mother and, when I was born in 1948, I was Christened; Edward Harry Paul. He has always been part of my life and I am proud of what he, his crew members and the thousands of others who also gave their lives in the defence of freedom did for us all.